The 2006 CODATA Prize was awarded to Dr. John Rumble, Technical Director for Information International Associates. 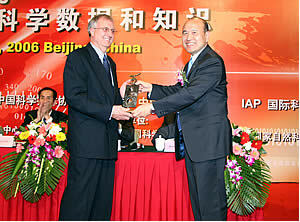 John received the prize in Beijing, China, on October 22, 2006, during the 20th CODATA International Conference. The prize is awarded biennially for outstanding achievement in scientific and technical data. 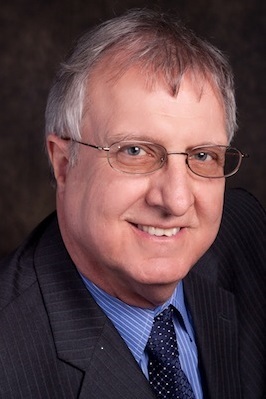 Dr. Rumble, former Director of the Standard Reference Data Program at the National Institute of Standards and Technology (NIST), was honoured for being “an innovator in the world of scientific and technical data.” He has been instrumental in extending data evaluation techniques in new disciplines, including engineering, materials, and biotechnology. John has long been a leader in using advanced information technology for developing computerized databases, online data networks, and data exchange standards. In his professional capacities, Dr. Rumble led data centres ranging from the Joint Institute for Laboratory Astrophysics (JILA) Atomic Collision Data Center to the multi-disciplinary Standard Reference Data Program at the U.S. National Institute of Standards and Technology (NIST). After developing international teams to provide online materials data in the pre-Internet era, he led the NIST Standard Reference Data Program into the Internet era with the development of over 25 online Web systems. In every position he has held, Dr. Rumble has promoted the development of quality standards and methods and the recognition of the importance of good data management. At both national and international levels, Dr. Rumble has worked tirelessly to raise awareness of the importance of data to science and technology. He did this working through such organizations as ASTM and ISO where he worked to develop some of the first national and international standards for scientific and technical data. He also made significant and continuing contributions to CODATA through the U. S. National Committee, which culminated in his international presidency. His work in promoting international cooperation, especially through his CODATA leadership, has resulted in a stronger worldwide data movement. In addition to his technical contributions, Dr. Rumble has had a special role in mentoring young scientists and data managers. He has also encouraged the creation of a strong data community and has helped to develop future leaders in data management by bringing together the data, library, documentation, and archiving communities in such areas as infrastructure development, archiving, preservation, open access, and intellectual property rights. Dr. Rumble has been a unique leader in the international data community. He was instrumental in launching CODATA’s Data Science Journal, the leading scientific publication in our field, and served for a long time as the journal’s current Editor-in-Chief. He is well deserving of the highest CODATA recognition for his life’s work as “Data Manager”. Page based on the article published on the former CODATA website in 2006 (archives). John Rumble is currently President at R&RData Services and Chair of the Working Group on Nanomaterials at CODATA (as on 18th November 2015). John Rumble's current professional profile: ResearchGate; LinkedIn; R&RData Services; American Physical Society. CODATA/VAMAS Joint Working Group on the Description of Nanomaterials. "Comparing Approaches to the Description of Nanomaterials", post by John Rumble, published on the CODATA Blog, 7th August 2015. "Uniform Description System for Materials on the Nanoscale (v.1.0) Published", article realeased on the CODATA website, 16th February 2015.